« Christmas Fair and Winter Festival at Vörösmarty Sqr. Note: Date is Not Official Yet! Városháza Park, city centre (a 2-minute walk from Deák Ferenc metro station and tram termini: M1, M2, M3 underground lines, trams 47 and 49). You can also get there by buses No. 9, 15, 105: get off at Deák F. tér stop. The Advent and Winter Festival in Városháza park, located in Budapest’s city centre, welcomes visitors for the 6th time in 2018. The 5-week festival usually starts around mid-November, on a Friday and is on till end of December. 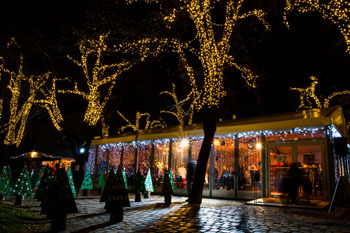 It is a smaller event than the official Christmas fair of the city on Vörösmarty Square (09. Nov – 01. Jan) but offers similarly rich cultural and family programs for both locals and tourists. TIP: Don’t miss the spectacular visual painting depicting Budapest’s history on the back facade of the Lutheran Church on 02. December, Sunday at 17.15! The tallest Christmas tree of the city – of 16 m height – together with a giant Advent Wreath measuring 10 m in diameter will also stand here in Városháza Park. The festival also hosts numerous charity events to raise money for various purposes. On the Opening ceremony on Sunday at 17.00 the first candle will be lighted on the Advent wreath together with Budapest’s festive Christmas lighting. The concerts take place in the heated Hütte. See also the official website of the event! 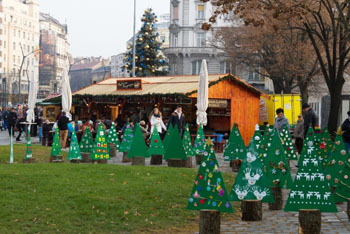 TIP: The Christmas Market & Festival by Budapest Basilica is not far from Városháza park. It’s open from the last weekend of November 2018. A wide offer of food and drinks, cratf fair, concerts, light painting and ice-skating welcome visitors.